This Friday was to be a busy evening. I had several events that I wanted to attend. Sometimes, just one is enough. However, this Friday seemed to be special, so I wanted to do as much as I could. The Blue Room Cafe was my first stop, to attend the opening of Eugene Mitchell. I have seen Eugene at Paul Henry's Art Gallery, at the Thursday night JAM. When David Mueller (proprietor of Paul Henry's) posted Eugene's work for the announcement of the opening, I found I really liked it. Eugene has the "voice" of NW Indiana in his art. The simple, colorful, joyful, family life he enjoys, and one I see in this region. Eugene's work appears to me as a celebration of life as he see's it. Here are some photos of the opening . . .
Eugene is on the right of the next photo. And of course those around to admire his work . . . I do encourage you to go see Eugene's work at the Blue Room Cafe. It will be on exhibition through December. Stay for a cup of coffee, sandwich, bowl of soup. Take in the art, the cafe, and downtown Hammond. As Eugene and I briefly talked about, NW Indiana is the place to be for artists. All Aboard!!! Next stop, the Whiting Art Walk, Whiting IN. This art walk took place on 119th street, with retailers between Studio 659 and the CornerStone Art Center, displaying art in their store windows. It was nice to see the art, people on the street stopping to see the art, and the proud artists who had their work on exhibit. A met people for the very first time, and found myself glued to the CornerStone Art Center, where Leon Sarantos had his exhibit. People were milling around, eating, drinking, looking at the art. Brother John Sarantos was present playing his Native American flute. John and I have become friends over the last few months. John had been on his journey, playing for all of us across the United States. So I was very happy to see him this evening. Here are some photos of the event at CornerStone. All Aboard!!! Next Stop, to see Diana Leviton Gondek's exhibit, at the Noyes Studio, Chicago Pilsen neighborhood. I met Diana at the Zhou B Art Center, Chicago Bridgeport neighborhood. When I heard she had something on exhibit in Pilsen, I wanted to go see. This was a fund raising event to help develop an artists residency program. Diana was proud to sell her work at this event. I was proud to be there, to see her work, and to photography it. Like more and more of the upcoming artist locations in Chicago, this one is in an old warehouse. As I walked through several floors, there were studios tucked away in corners, each of different art, of different voice. As I made the climb, the world around me began to make some sense. Art is everywhere. It is right next to you. All you have to do is turn around and look. This next photo is of a piece of art that caught my attention. These next few photos are of Diana's art. I chose to study it through the technology of my camera, changing settings, to see with a different perspective. In the end, though my photos show something different, I can only go back to the beginning, the original, to be pleased. Here are some more photos of the gallery. All Aboard!!!! Next stop, Musicville. Or should I write, The Abby? Lou Shields was playing at The Abby. My last stop for the evening. I enjoy Lou's music, the energy and fellow musicians that he brings to the venues. This evening, we started off with Tony French, joined by His good friend, Eric McCabe on harp. And of course, Lou could not sit still, so he asked Lady Stephanie to dance . . . and dance . . . and dance . . .
Next up was Lou . . .
You can catch more of Lou on facebook. Next up, Woodrow Hart and The Haymaker. It was a busy evening. A few miles to go. It all fell into place nicely, to be able to see all my friends and all the art. Beatniks On Conkey presents . . . the physic, the secret, the investigation, the scary and terrifying . . . you will jump out of your seat!!!!! Okay, do I have your attention? Don Taylor, director of this play, invited me to photograph the rehearsal for "The Haunting of Hill House". This was a joy to watch and photograph. Please know, the photographs that I will show are of the rehearsal a couple weeks before opening night . . . this was not a technical rehearsal. This is a suspense drama by F. Andrew Leslie, from the novel by Shirley Jackson. Based around the supernatural, and the small part of the play I witnessed, this is a real treat for us, for this coming Halloween. 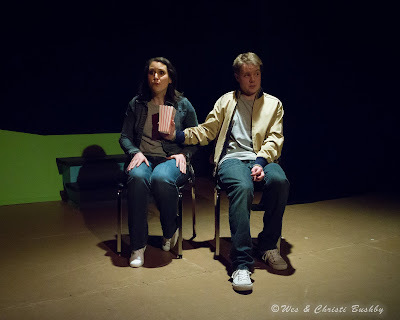 Here are some early early photos of the play when it was being rehearsed. Obviously I want you to go see this play. The actors are great, along with the director, who all deserve our attention. Support the arts in NW Indiana. Support Beatniks! Okay, I have been wanting to write this for some time. I am a hippie/beatnik at heart: The lama, the cat, of Beatniks is Rip Johnson. He is off the wall and tuned in. He is not a cube, but crazy man. Beatniks is off the wall and has a beat about it, so do not miss out on this way out venue ! Tickets are $12 and can be bought Online (click here) or at the door.